I am concerned about my patients correctly using home traction units. How can I monitor or test if the patient is using the specific model of traction device correctly? One of the most effective ways to correct and teach patients about the use of home traction units is to provide them with the unit in the office or therapy room. The doctor or therapist can then walk the patient through setting up, adjusting and applying the traction correctly. The patient can ask questions and the medical professional can provide immediate feedback and tips for how to safely and correctly use the device. This is a great option even when changing devices since home traction units can have different operating procedures that the patient needs to know. What options are available for lightweight traction units that are easy for home use? For both lumbar and cervical home traction units portability, ease of use and minimal requirements for specialized additional equipment or supplies make these models very easy for home use. The cervical traction devices that require separate weights can include bags that are filled to volume levels with tap water or pre-set weight bags that are three to five pounds in weight. The water filled bag is very easy and lightweight to move as the contents can be dumped, leaving only the empty bag to transport. Harnesses, neck rolls or door clamps and pulley systems are also very lightweight and highly portable. 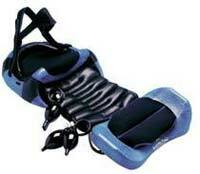 The more advanced types of home traction units for the cervical spine are also easy to use and very lightweight. They use air pressure that is controlled with a pump and a click in place device for accuracy when the traction force reaches the specified amount. There is also safety features such as blow off values built into these home use cervical traction devices that prevent too much pressure from being applied with incorrect reading of the gauge or incorrect operation of the device. Are there lumbar home traction units available or are they all cervical traction devices? There are models of both cervical traction units as well as home traction units that specifically target the lumbar area. Lumbar units tend to be larger in size than those that are just for cervical traction and they also have additional types of unique safety features. One of these features is a non-slip harness that allows the patient to set up the harness and belts once, ensuring that everything can be kept consistent to replicate the traction provided at a medical clinic or in a therapy program. The hand pump also allows patients to adjust the traction levels and then click into place, again providing added consistency throughout the use of the equipment. Lumbar treatment can include a maximum force of up to 200 pounds, which is considerably more than is generated at maximum levels with the cervical home traction units. These systems also have a quick release feature that allows the patient to very safely and instantly stop the traction force if there are any complications or difficulties at any time during the home session.